Hair falling out of the expensive updo before pictures, eyelashes coming off, makeup running, dress strap breaking, shoe strap broken, spill on outfit, lipstick coming off, broken nail, wardrobe malfunctions, last minute tailoring needed, bra showing, germs EVERYWHERE, runny nose, too much garlic, something in your teeth, headache before event begins, cramps.. etc. As a makeup artist I had alot of beauty emergencies with my actors on and off the set. Everything I had in my set bag was there because ONE time someone asked for something and I didn’t have it. 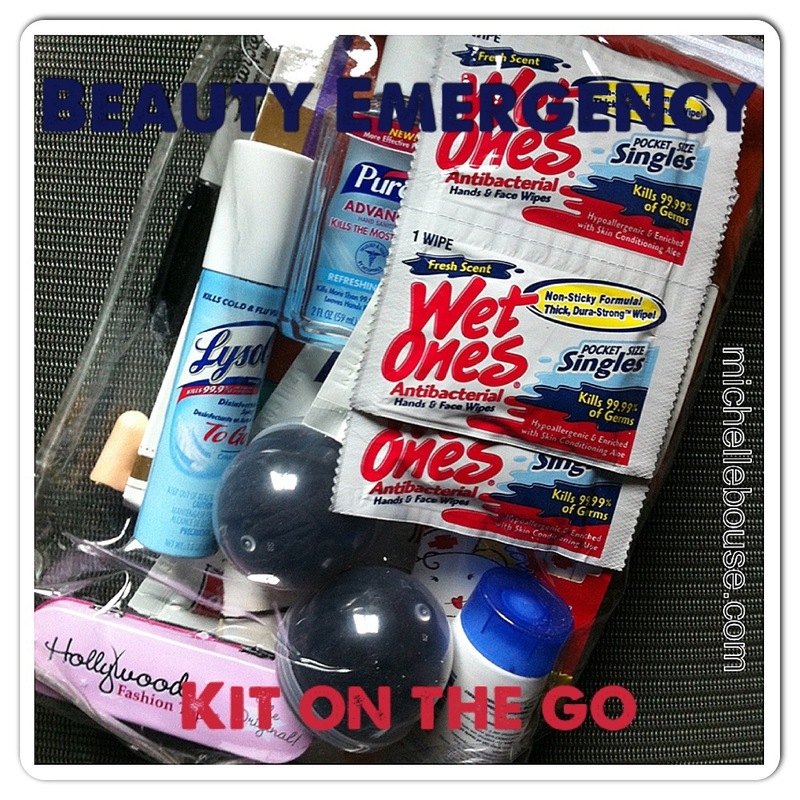 So in life, when I attend a special event – I pack my “Beauty Emergency Kit” inspired from my years touching up on set. Altoid mints (mini).. has anyone tried the new nordic mint? A mirror – to smile into or share with friends! Bonus: I use those zippered pouches curtains or sheets come in.. why not? Cheaper than a cosmetic bag. If you have had any stories and would like to share your “Beauty Emergency” fixes, please contact me. Or add a comment. I’m often asked what it like to be a Hollywood Make-up artist and having an TV Executive Producer as my husband. It’s not as glamorous as it sounds – it is ALOT of word and tongue biting, but YES! It has definitely been a fun adventure! I asked my husband some questions, then answered my most frequently asked questions. With a few fun photos we hope you can get a sneak peek of being behind the scenes with us on Hollywood shoots. What is your official title and what does it mean? of the commercial, hire the director, producers, cast and crew. the flowers in the background of a shot. What is a casting session like with all those beautiful models? days than seeing fifty or sixty beautiful women at a time. fires that pop up at the worst possible time. have your head in the game at all times. If you could pick a favorite shoot which would it be and why? at a grip truck or a generator. It’s not the same. How many celebrities have you met and who was your favorite? seen dozens of times in magazines and on TV. What are you favorite makeup products? I use everything. 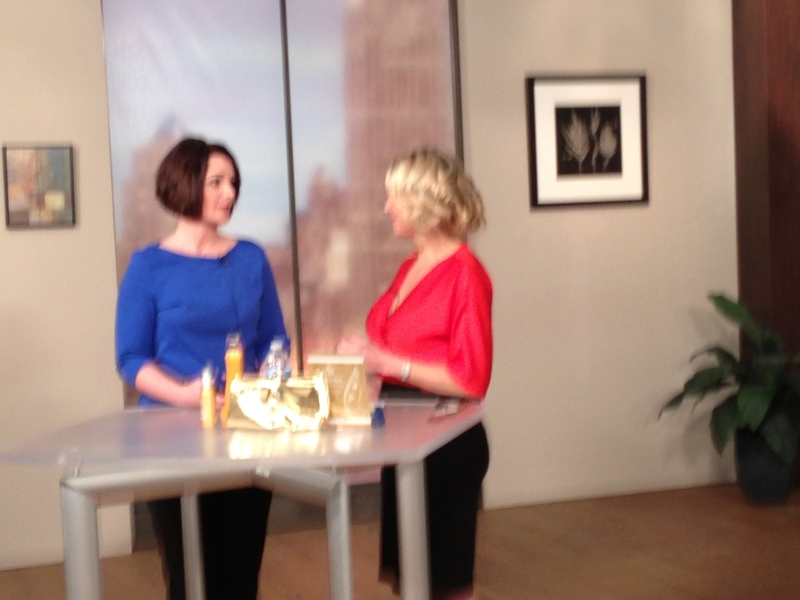 I have a bridal kit, a tv kit, a fashion shoot kit and a airbrush kit. I love Laura Mercier concealers & tinted moisturizers. Gerda Spillman foundations. Cover girl Lashblast mascara. Ardell lashes & Duo adhesive. 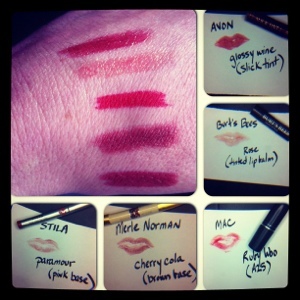 MAC lipsticks (viva la glam & spice liner are staples). Creme blush & Makeup forever black liner. Stila shadows & MUD shadows rock! What was your craziest shoot? Probably the craziest shoot I was on was shooting in downtown LA for over two weeks for all nights. We started at 4pm with makeup call times, started filming at 7pm and wrapped (finished) at 6am as the sun rose. Who was your favorite celebrity? What is the hardest part of being on a shoot as a makeup artist? Location and the long hours are always a challenge. I’ve shot in studios, on locations, at celebrities homes, in the rain, in the subway, in the desert, in freezing cold, in a closed book store (that was one of the coolest shoots – overnight) and in a bathroom. It isn’t as glamorous as one might think. I have to be awake and ready to greet and talk to people usually by 7am (that is set-up & at the location). No matter what is going on in my life, I have to have a smile on my face because my attitude & interaction with the talent will set the entire tone of the day. A good makeup artist makes their talent at home, comfortable and at ease without a stitch of makeup on their face. What is it like working so closely on a celebrity? Well, celebrities are regular people just like us. They just have a job that regularly puts them in the public eye. Some are delightful, some are very difficult. I have found the celebrities that have been around the longest are some of the nicest, most down to earth people. They are truly veterans of the entertainment industry and have nothing to prove, have been around and their careers have evolved. It is very important to ask before hand what their specific likes and dislikes are. I ask if they want me to use specific products or if they have an allergies. I love what I do and I am so blessed to have had the opportunity to work on all the personalities I have. It has been an amazing adventure! What’s Your FAV Red Lip? These are mine..
Hello and Happy Fall! I recently started answering some makeup questions via video and this is the short version along with the product recommendations (and the places you can find them). Please let me know if there is a makeup question I can answer for YOU! These are the lines, find your perfect shade! Let me know what you think.. I Scream, You Scream.. We all need EYE CREAM! From a recent conversation with my Pilates trainer, I have realized a lot of people do the bare minimum for skincare. Cleanse, maybe moisturize, maybe SPF. If you are over 40 years old and want some advice, besides washing before bed, using eye cream may be the second most important step in staying youthful. We all start seeing those mysterious lines around our eyes. Dry skin can make these lines even worse. 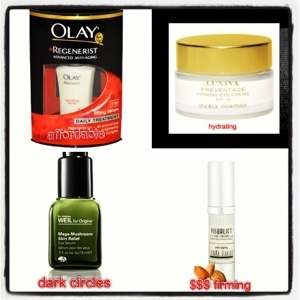 Here are a few products I LOVE for eye creams and one should be able to fit anyone’s budget. The range is about $30-110. Caffeine is one of the popular ingredients for tightening and taking puffiness away. The most important thing is to use an eye cream every night. Place it next to your bed if you need to. You will definitely see results within 2-3 weeks and be glad you did in 10 years! Please let me know if you have any great finds I can add to my list or questions. 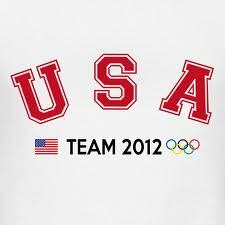 We are all enjoying watching the Olympics and all the wonderful diverse events. Which is your favorite? I LOVE gymnastics (of course) but I am like a magnetic to any event in water.. swimming, sync dancing, water polo, diving (and I have NEVER seen syn diving before – WOW!).. which brings me to my question. What makeup are those athletes wearing that allows them to jump off of a platform or diving board, swim few meters and come out gorgeous and not like night of the living dead with makeup pouring down their face?!?!?!? So here I found it. I believe MAKEUP FOREVER is sponsoring the Canadian team in syc swimming. But the most brilliant find is the makeup line.. AQUA. The foundation was actually designed for the water ballet! The creator worked as the teams makeup artist and developed the makeup line. Ah ha! BRILLIANCE.. Mystery solved and the end result is definitely AMAZING! So rock on TEAM USA and let’s enjoy those pool close ups! If it works on the Olympians, you may want to check it out for a hot, humid summer night of fun. Now my next Olympic question.. why do they all bite their medals???! ?